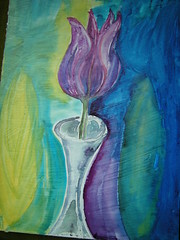 In case you didn’t know me by now, Tulips are my favorite flower. I love their combination of simplicity + elegance and want to be just like one when I grow up. What? I can’t be a flower? What? I am already “grown up”? 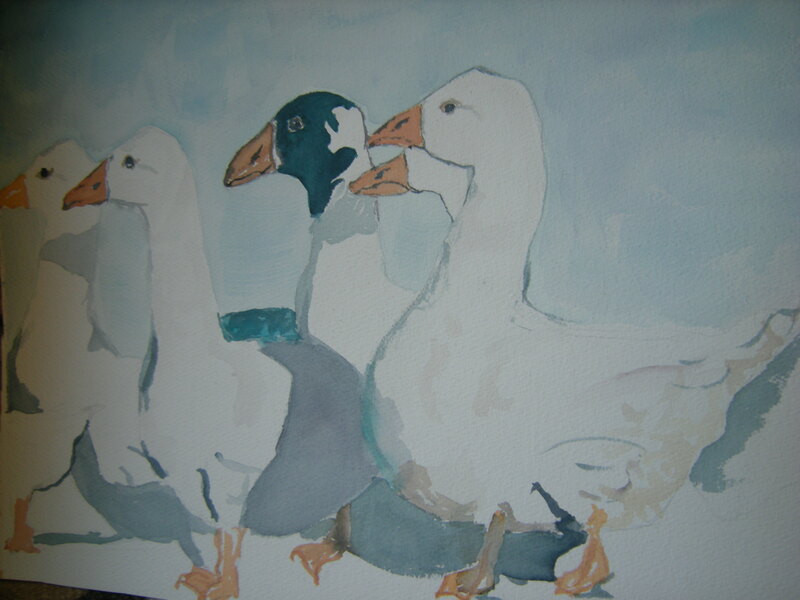 This watercolor was learning to paint on gesso. We painted the gesso on the board with brush strokes moving in different directions to add textural interest. Then we were encouraged to watercolor based on those textures, mine reminded me of big leaves, so that’s what I painted on each side. And then the tulip appeared. It just wanted to be there. There was no still life or picture used as the basis for this, it was entirely out of the imagination. Personally, I think it looks like the kind of picture you see in model homes, you know the kind? Where nobody lives? Once upon a time, I fell in love with this book. The Art of Illumination, Patricia Carter. I couldn’t stop thinking about it. (Thus the nature of love.) So I went back to the Art store where I first saw it…and it was gone! And then I attempted to combine many of my loves. My Love of the Scriptures. Look what I dug up the other day! Wow, its amazing to see stuff I did twenty-some years ago. I abandoned this watercolor because I couldn’t make the girl come out right. I am not so good with the human figure. Once, I drew just a face, in my Study of the Masters class, and it took me eight hours! 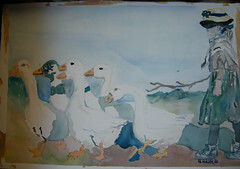 So, I thought I would try another one with just the geese. and then I abandoned that one too. I have no idea why. In order to help moderate the ATC’s on Ravelry group, I have been digging up my past artwork and photographing it. Hopefully, it will help to illustrate various techniques using various mediums. Its been a nice trip back in the Way-Back-Machine to see my artwork again…after being tucked away for years. 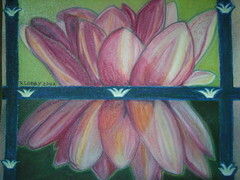 This one is a waterlily reflected in water done with soft pastels. I took a Soft Pastel Art Class at Marylhurst University from Dennis Cunningham, who won the Teacher of Excellence Award the following year. Dennis is a terrific Pastel Artist (and other mediums) and I was really glad to have the opportunity to learn from him. 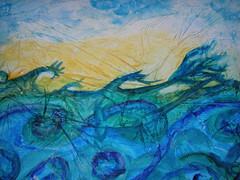 Here is something I painted many moons ago when I took a Watercolor Class on how to create textural effects. This one, when done, reminded me of choppy water, so that is how I painted it. The painting itself is not meant to be terrific, I was just learning how to create the effect. Although it is kinda Van-Goghish. Starry Nightish. Sorta, kinda.